AwesomeAl had the most liked content! Sorry buddy no, We've only ever seen them fitted to the TDI's. Not sure if the SDI has the correct type of ECU for this to work. Either way volkswagen don't recommend the retrofitting of cruise control to lower powered vehicles as they often don't have the power to keep up the speed if aproaching a hill in a high gear. Thanks Ray! I forgot Jon had it! I've since had a lupo in the workshop for cruise and got a snap of it! Customer was very happy to find that I'd gone over his dashboard with a microfibre to get rid of all the dust after the technicians finished the job! lol. We must have hundreds of Sad and Lazy customers then in that case... As a general thing we fit between 12-18 cruise control installations in our workshop each week! 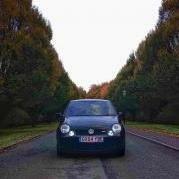 I've personally done a couple of cruise controls on friends Lupo/Arosa TDI's. They are actually a pretty usefull tool if you are A) Heavy footed and want to stick to 70mph (ish) on the motorway, or if you regularly go through Average Speed cameras whilst tired. Hey Guys! (and girls)... I'm currently doing a lot of work rebuilding Awesome's website and eBay page and was wondering if anybody has a Photograph of Cruise control installed on a Lupo or Arosa. I'm looking for a photo with the following qualities: * Nice and clear * Doesn't have to be too big but a reasonable size will help * The dash must be standard, not painted or sticker bombed * Cruise control must be installed!! (Bit of an obvious one that one though). * You must be able to give permission for me to use the photo on our site (I.E. Not someone else's image!) If any of you guys have anything that would fit in with the above, that would be excellent! Many thanks, AL. Awesome Ltd. Awesome / Detailed Summer Bash! THIS SUNDAY!!! Show and shine is first come first served and entry is available on the day but you'll need to be up at the crack of dawn as last year we had people arriving at Silly 'O Clock to get in show and shine! Awesome/Detailed Summer Bash - Sunday July 29th 10am-4pm at Awesome in Manchester. Once again, this year we are holding our annual open day and Detailed Summer Bash and would like to invite everyone along. Each year this event just gets larger and larger. - Free entry - Awesome discounts on the day - Dubkorps VAG clothing stand - Detailed UK and Forum club displays - On-site entertainment and catering - Rolling road demos - Stock clearance sale - Show + Shine Keep up with news of the event by : Facebook : http://www.facebook....41877665883302/ Website : http://www.awesomegti.com/shows Or if you have any queries, Give us a call on 0161 776 0777 (option 1) If you're on a club stand, you will need to be with us by 8.30am, 9am at the very latest in order to get your position on the stand. We look forward to seeing you all on the day! Well I've not officially had one name down so may not be worth bothering. The club stands will all be in the main parking area anyway, so just a case of getting in early and parking up! Ideally I'd need at least 5 cars to make it look any good! Sounds like a Plan! Cool cool. I don't think club lupo will be having a club stand as I've not really had enough enquiries or names put down. I'd probably say try and travel up in a group so you can all park together! Ace stuff! Would club lupo be interested in a club stand for this at all ? LOL! Bring him in your car, He's not allowed his subaru on or near the premises.